Myanmar protesters call for the release of journalists facing criminal charges filed by the military. Photo courtesy The Irrawaddy's Facebook page. Media groups and activists are calling for the immediate release of three journalists who were arrested by the military in Myanmar's northern Shan State on June 26, 2017. The Irrawaddy and DVB are among the few independent media organizations that reported on political issues when Myanmar was still under military rule. The Irrawaddy is a content partner of Global Voices. 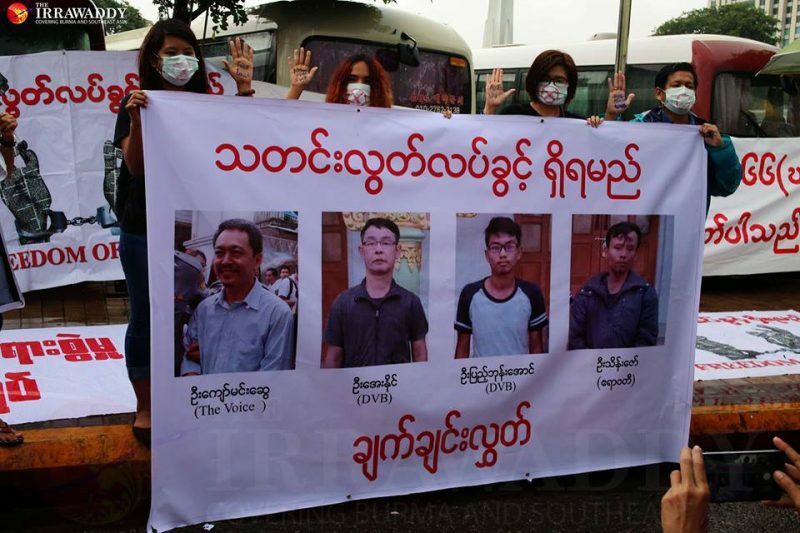 Lawi Weng from The Irrawaddy, and U Aye Nai and Ko Pyae Bone Naing from the Democratic Voice of Burma (DVB) have been charged under the Unlawful Associations Act and could face up to three years in prison if convicted. A colonial-era law that criminalizes membership in an “unlawful association”, the Unlawful Associations Act punishes any person who “contributes or receives or solicits any contribution for the purpose of any such association” with up to three years in prison. After Myanmar’s military-backed party lost power in the 2015 elections, the former opposition National League for Democracy (NLD) took control of the government, under the leadership of Aung San Suu Kyi. This inspired hope that media freedom would be protected by the new ruling party, which had struggled for many years to restore civil liberties and democracy in Myanmar. At the time of their arrest, the three reporters were in an area controlled by the ethnic armed group Ta’ang National Liberation Army, gathering information about drug operations in the state. Tensions between the Ta’ang National Liberation Army (TNLA) and the federal government have long run high and turned violent in late June. The TNLA which is fighting for more autonomy for the Ta'ang ethnic group, has not signed the government’s nationwide cease-fire agreement. Myanmar has more than 100 ethnic groups, some of which are armed and actively assert a right to self-determination. The armed conflict has lasted for several decades, and intensified during the nearly five decades of military dictatorship. The new government, which assumed power in 2016, has pursued a national reconciliation and peace process, but has encountered difficulties in many areas, including Shan state, where the TNLA is most prominent. Despite losing power, the military continues to wield strong influence in the bureaucracy and parliament through the constitution it drafted in 2008. Press members must have the right to do their job anywhere. What is important [for journalists] is to report fairly with no bias…It makes no sense to arrest journalists for doing their job and gathering information. An NLD official questioned the presence of the journalists in the conflict area, arguing that ethnic armed groups should seek the permission of Myanmar's Peace Commission before inviting journalists to cover their activities. The charges that the journalists face are unrelated to such permissions. Aside from the arrest of the three journalists, media groups and activists bemoaned the rise of defamation cases filed by authorities against members of the media. They launched a signature drive calling for the release of the journalists and the repeal of Article 66(d) of Myanmar's telecommunications law, which covers online defamation. The hearing for the detained journalists is scheduled for July 11, 2017.